Is nearly financially impossible. We are taking a trip over Christmas to visit family and will be renting a car to get around. I'd love to rent a hybrid car but do you know what the cost differential is? It's astronomical! We've rented a hybrid in the past (like 2002) and it was more expensive than a regular rental, but not this bad. I'm getting the feeling that rental car agencies are fleecing people who want a green car. On one hand, you could argue that there's so much demand to rent a hybrid that they can charge such high rates. But, really if that were the case, then they'd have a whole fleet of hybrids then. Otherwise, why the giant cost increase? I think they really are taking advantage of people. What's the price differential you ask? For a similar sized car, the standard gas vehicle (for the lowest option) is $217. For the hybrid car (for the lowest option) the cost is $707. That's almost $500 more or about 325% higher. WTF? I know we didn't pay that much more years ago, when hybrid cars were actually scarce and more expensive than they are today. Very irksome. So, I reserved a 4-door speck that gets gas mileage in the 30s instead. Have you ever rented a hybrid when you've travelled? Good gravy! Rent it often, and you might as well buy one. Well, not quite, but Geez Louise! That's what it would have cost me to rent a car for a month as a driver under 25 last August! It seems really unfair if you ask me. I don't think too muchh about using gas though. I only leave my house a few times a month and my car gets 25 to the gallon. My BF's car gets as good or better MPG than many hybrids. Hybrids are only really good in the city and we're rual. He gets around 35+ in his little sports car, even with the top down! I say rent the car with the best mileage you can (none hybrid) and eco-drive it. That's just nuts. I know, it's just nuts. That's freaking nuts. I'd report them to the better business bureau. Do they give a rationale for why it's so much more expensive? I've never rented a car... I don't get away much :) And when we go on a family trip, my parents tend to rent a big van so we can all fit in it. Whoaaa! I haven't rented a hybrid, but one of my friends did 3 years ago in CO. She didn't mention that kind of price differential! I know that some hotels offer free parking for hybrids, but even that plus the gas savings wouldn't nearly make up the difference. I wonder if it's like that everywhere? We like our Prius and usually get 48 - 52 mpg. yep. That stinks. It's the All American Business Plan. Screw 'Em For Everything You Can Get! Which, oddly, is why all us krill are dead broke. Bad bad business- bad for everyone. Idiots. I wonder if you have a congressperson who might be interested in a little investigation? And maybe a headline or two? We were going to rent a hybrid to go to Vegas a few years ago and the price was more but it wasn't that bad. That is totally ridiculous. I worked for a (LONG) year and eight months for a major car rental company. The rationale to charging higher rates on hybrids goes like this: You're reserving a *specific car* and not "something of a similar size" like most people do. Speaking from the employee's point of view, the fact is that it's much, MUCH harder for the car rental company to guarantee they will have a specific car for you, so you get quoted full list rates with none of the built-in discounts you would get if you just asked for "something like a Taurus" (Taurus-size covering cars of a similar size and that seat a similar number of people). Why is it harder to guarantee a specific car? Many reasons. The most common of which is the branch has only a few in their fleet (sometimes only one or two shared among multiple branches). The next reason is that it's actually very common for cars to get in accidents - and if your hybrid is one of the accidents that week it puts that car out of commission, and the employees have to scramble to find you a backup. So are higher rates on hybrids legitimate? It depends on what type of hybrid you wanted. An extra $500 a week sounds a bit high for a car-size hybrid, but not for an SUV-size hybrid. Hot car rental tip #1: Never reserve a car at an on-site airport branch if you can avoid it. Airport branches are subject to very high fees imposed by the airport, plus airport fueling fees, plus any additional tourism taxes. These hidden costs are not built into the rate they quote you, and they jack up the actual out of pocket cost of your rental. The upside to renting at an airport is that they are open much longer hours and often open on Sundays and holidays. But you're paying big time for that convenience. Hot car rental tip #2: Reserve as small a car as you possibly can stand and still fit your number of people and bags. When you arrive to pick up the rental, ask if they have a deal on a larger car. Chances are good they have more reservations for small cars than they have actual cars, and will be happy to upgrade you to a larger car for a reasonable rate. We found the same thing when we were pricing rentals for our trip to Missouri last year. No way could we afford to get the hybrid. So, we just picked the smallest car we could all fit in. I worked for a (LONG) year and eight months for a major car rental company. The rationale to charging higher rates on hybrids goes like this: You're reserving a *specific car* and not "something of a similar size" like most people do." That's a nice rationale- but- I have a very hard time believing it actually costs the company $500 to undertake to have a specific MODEL of car available. I'd believe $100; maybe even $200. But what I also know is that it's the oldest trick in the book for sellers to wail "look, I'm helpless here! My costs are through the roof! I'm losing money selling it to you this cheap; but since I'm so understanding, just this once, my friend, I'll help you out! But it's taking food out of my children's mouths!" And- when their costs go up 50¢; they'll always raise prices by $1.50 - and blame it all on costs. I tried to rent a Hybrid in SF in 2005, but they were all booked up. I don't think the rate I was quoted was anything more outrageous than the fact that SF car rental rates are outrageous to begin with. Most of my employed years have been in hospitality, first as a desk agent/concierge and later as a manager. I've had some fairly significant relationships with several car rental agencies and some of LadyCiani's tips ring true. I personally, always reserve a small car and always seem to get a free upgrade to a bigger car. On the flip side, as a hotel/concierge manager, we used to reserve specific cars through Enterprise and always got the same good rates for our guests. We also use to rent large SUVs with four wheel drive for the hotel to use and would usually request the same vehicle, and we never had a problem. In other words as @LadyCiani says, if they accept multiple general reservations they can mix and max cars and people, but it is harder to do that with a hybrid of which they may only have a few. However, taking specific reservations (as the SF Enterprise appeared to do) should not automatically result in an astronomical rate increase. It is bad business management to not a have a plan to fulfill your customer's needs. A hotel might have only one sweet with a jacuzzi and if it breaks, you give the customer some sort of benefit, like a complimentary dinner. 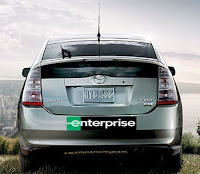 If you run out of hybrids, you give your customer free insurance or a different perk, to keep them happy. Nuff said. I hate to say it But No I hav enever rented a hybrid. I take my rental time to rent some gas guzzling monlith car. Good thing I only rent every 10 years or so! It's not just renting the hybrid. With little notice, I had to replace a car last week. In the end, I could not justify the most costly price difference to buy a hybrid and went instead with a small, fuel efficient / low emission car (Honda Civic).